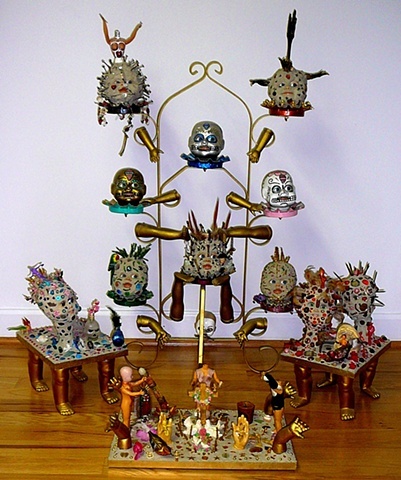 mixed media: flower pot stand, grout, wood, dolls, doll's heads, doll's arms and legs, alligator feet, turkey leg, bones, false teeth, feathers, beads, jewels, glass birds, plaster figures, safety pins, acrylic paint, toys, plaster dental molds, shells, stone, pipe cleaners, plastic flies, wood birds, glass skulls, glitter paint, nails. i was at a flea market and found an old rusted outdoor plant stand. thought to myself...ah......clean it up, put plants in it, a nice summer treat! then i thought......NOT.......too "normal" ( lol), so decided to make an art piece instead. originally it was going to be an outdoor piece, which is why i grouted the original set of "doll's heads". grout can withstand the elements. i have several grouted doll's heads on poles in both my back and front yard (who knows what my neighbors must think!). but then i liked it so much i decided to keep it inside and expand the piece to have 3 side/front pieces. since it had to do with "plants" the old nursery rhyme came to mind:" mary mary quite contrary. how does your garden grow. with silver bells and cockle shells and pretty maids all in a row". well, obviously too long a title for an art piece so i shortened it to "mary mary...pretty maids all in a row". once i finished it and placed it in my living room the cat decided that she also loved it and started "chewing" on the 3 side/front pieces. oh no. so i took those up to my studio and boxed them for safe keeping. the cat still likes the main standing piece but doesn't seem to chew on it as much. whew! what is weird is that the doll's heads move......i go to bed at night and they are facing one way. in the morning they are looking in another direction! maybe they "play" at night? "mary mary" has been in several art shows. when i work i never know what i will create. i usually start with an idea of a color or found object or "form" like the plant stand for mary mary. then it all; seems to flow out. i am usually quite surprised by what i get in the end...and mostly pleased..though not always. i seem to create from some place inside me that takes over....if that makes sense. A little creepy, but I applaud any kind of creativity  so cool. Excellent artwork Jennifer!!! Hugs my friend! Yet another stunning collection . Wow, Jennifer, it's SUPERB !! Sincere compliments !! I am watching again Your Art, oh, Jennifer so manly levels!! So lot of Life, and Imagination! Dance of Unconsciousness!!. I admire Your Love for Life and Acceptance Life like it IS. Brave You Are, and Beautiful. Strong. Now, this morning I see, I feel the most Hands and (Im) possibility for Connection. True Connection. True Touch. Support, too. They speak, they reach, they explore, they say "hello & good by", they don't give up and there is Hope. Very beautiful piece!!! Love it!!!
. absolutely amazing creativity Jennifer. love love love it ....awesome work !! this is a great piece, jennifer. exceptional and creative ... very fine work !!! Wonderfully creative piece. I like your style. this is giving me the creeps. i love it. -yes, "flies" really add that "creepy" factor to one's art! AHHH! Must. Avert. Eyes! Can't! This really makes me smile! Wow! So disturbing yet so beautiful! Very cool! I really like the variety of elements you used in this one. You have created your own language. But for some reason I understand every word!! LOVE it!!! It's one of those pieces that make me want to scream with delight !! genius. Love the details!!! Excellent work!!! Wowowowow, so cool!!!!!! What a major imagination!!!!!!! Doll heads that move at night while you're sleeping.... now, that is just too creepy for me! LOL!! Great piece! I love the story of how it came to be, too. but I've not your creativity. A fabulous artwork and so beautifully presented, Jennifer! Marvelous composition and wonderful collection of nic-nacs, very well done!